Duke University Press, Durham, North Carolina, 2018. 184 pp., £13.60 pb. Emilio de Ípola, described in the book’s foreward by Étienne Balibar as a dandy ‘you might see up on the barricades with a cigar between his teeth’ (xiv), has produced a pleasing, innovative and useful book on the philosophy of Louis Althusser. Aimed originally as an account of the ‘last’ Althusser, it is instead a personal memoir and a sustained discussion of the inter-relationship between two different approaches advocated by the French Marxist philosopher. I had a number of doubts about de Ípola that, largely resolved, guided my reading. Louis Althusser (1918-1990) was, during the 1960s and early 1970s, not just a Marxist philosopher, but perhaps ‘the’ Marxist philosopher. He attempted with his closest students including Balibar to produce a philosophy for Marx. By this he meant not to merely describe Marx’s philosophy but to develop concepts that would, in turn, produce a philosophy for Marx. Such a philosophy would develop new concepts that would allow for Marx’s thought to be mobilised more effectively to transform society. Boldly constructivist but, at the same time, materialist and focused not on academic Marxism but the practicalities of revolution, Althusser aimed to make Marxism fully scientific. The attempt, in books such as Reading Capital and For Marx, arguably ended in disaster but his effects, including those upon Althusser’s students which included such significant figures as Derrida and Foucault, have been significant. Althusser, prone to bouts of severe mental illness, fell from grace as swiftly as he had risen. His supposed arid and anti-human structuralism lost favour with the rise of post-structuralism, the collapse of the Soviet Union and the generalised retreat of the left in the 1980s and 1990s. The brutal murder of his wife Hélène Rytmann led to his oblivion but even without this crime, his work would perhaps still have been dismissed by his death in 1990. I was also inclined to dismiss de Ípola’s book. The publishers have presented it as an account of two contradictory projects: Althusser’s initial apparent structuralism and the aleatory materialism revealed in the publications from his later period. This now seems to be a well-worn narrative which has been presented in a series of earlier accounts including Warren Montag’s remarkable Althusser and His Contemporaries (2013). 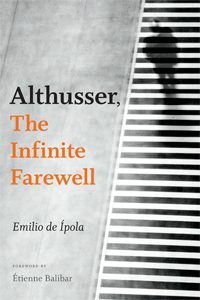 However Althusser, The Infinite Farewell is far more original and exciting than it appears from the publishers publicity! De Ípola’s accomplishes several things in the book. First, he has produced a personal account of being a student of Althusser himself in the 1960s. In turn, while he covers a number of debates about Althusser’s work which, even in translation, are clear and engaging, he produces a particularly useful account of how the supposed later aleatory project is to be found within Althusser’s earlier work. A personal account seems, of course, another area of potential doubt and dismissal. Althusser was both charismatic but dismissive of his own biography. He wished to produce a philosophy that produces effects but noted that our personal biographies are the effects of far from immediately visible causes. Althusser’s scepticism about the role of the subjective in events made him notorious and this is the basis of the polemic on Althusser’s work from British historian E.P.Thompson in The Poverty of Theory. Nonetheless, the personal account from de Ípola’s indicates some of the excitement of attending Althusser’s seminars in the 1960s. It makes for an entertaining read. As an Argentinian, de Ípola provides a particular and interesting Latin-American take on Althusser’s work. During the 1960s and 1970s, Latin American states including Argentina, Bolivia, Brazil and, most notoriously, Chile, suffered from right-wing coups with the US helping to install brutal dictatorships. Many on the left sought exile in Europe. Althusser became perhaps a more significant and continuing influence on the Latin American left than the left in Europe or other parts of the world. His work influenced liberation theology, notably with the Boff brothers, Marta Harnecker’s manual based on Althusser’s work and Ernesto Laclau whose work grew from Althusserian roots. The Latin American perspective on Althusser’s work is of particular value. However, it would have been useful to have read in this short book something more detailed about the reception and importance of Althusser’s work, for example, as an inspiration for Latin American social movements and left governments. De Ípola’s most important labours are directly theoretical. In an illuminating manner, he discusses a number of key debates around Althusser’s work. The important albeit vexed nature over the debate around ideology is explored. Althusser’s discussion of varied non-Marxist thinkers such as Machiavelli and Montesquieu is also developed. The most exceptional and important element of the book in my opinion is the discussion around Althusser’s supposed structuralism and the relationship to the aleatory within his thought. Althusser has generally been described and in turn often condemned as a structuralist. At the time, his work and that of his close associates in the 1960s and 1970s built upon a school of hegemonic, French structuralism which referenced Barthes in literary theory, Levi-Strauss in anthropology and Saussure’s linguistics. Here, language provided the basis of reality and human behaviour within sociology, politics, economics, etc, was seen as a product of underlying structures that determined our collective behaviour. The French psychoanalyst Jacques Lacan argued, typically perhaps, that the human unconscious was structured like a language. Althusser was criticised as having rejected human agency and grasping human being as bearers of structural relations. Politics was an objective science based on an understanding of structural forces and so politics as the subjective struggle of a humanity seeking a better future was apparently dismissed. Crudely, where E.P. Thompson suggested that the working class made themselves into a social subject through collective action, Althusser’s structuralism suggested that history has no subject, that our actions are effects caused by underlying structures. What has become clearer in recent decades is that while Althusser had little faith in the notion that humans are independent actors, his relationship to structuralism, even in the 1960s, was problematic. This point is well made by de Ípola’s book. As it has become apparent in recent decades, other than Marx or Lenin, Althusser’s key influence was Spinoza. The Jewish-Dutch philosopher argued that humans have no kingdom within nature and by this he meant that while we experience subjectivity, we are shaped by forces that are not immediately visible. We cannot suspend the influence of nature. While Freud’s exploration of the nature of the unconscious alongside Marx’s critical analysis society have reinforced this notion that we might have agency, such agency is far from complete. Althusser revised his approach dramatically in many ways but has remained sympathetic to the notion that our apparent belief in our own subjectivity and independence of action is illusory. Derrida critically review the flawed nature of the structuralism of the 1960s, noting that it could not account for the existence of the very structures it suggests. While de Ípola’s does not directly examine Derrida’s critique in detail, he shows the same critique is inherent in Althusser’s work. Perhaps the contingency of structures is the death of structuralism. Althusser is aware that structuralism cannot explain how structures came to take the form they did. As de Ípola’s notes, Althusser later work, published only since his death, focussed on an alternative to structuralism. This aleatory project is an alternative form of materialism. The word aleatory is associated with the throw of a dice, of chance. We move from a Marxism of historical inevitability to one of chance encounters and accidents. De Ípola poetically surveys often obscure unpublished texts from Althusser’s final year, where they are kept in an abbey in Normandy, a building that still shows the visible signs of World War Two bombardment. He notes that in Reading Capital, structural causality, based on the over-determined interaction of different structures, indicates that Althusser and his students were already rejecting the simplified structuralism of other thinkers. From the interaction of different structures it is a relatively small step towards the aleatory approach. While Althusser argued that aleatory materialism was a hidden materialism found in such authors as Lucretius, Machiavelli, Spinoza and Marx, de Ípola suggests that, if read with care, an aleatory approach is to be found in Althusser’s work from the early 1960s. De Ípola has, in conclusion, produced a significant addition to the secondary literature on Althusser, based on both his own biographical experience and some serious digging in the archives. This short book deserves a place on the shelves of all of those who value Althusser as a serious thinker. To my mind, the most serious reader of capitalism was Marx and the most serious, although often conflicted, reader of Marx remains Althusser. De Ípola helps us read Althusser more precisely and in doing so will no doubt contribute to more effective political interventions. That said, a book charting in detail Althusser’s relationship to the revolutionary social movements and parties in Latin America remains to be written and would be of great value. “In fact my philosophical knowledge of texts was rather limited. I was very familiar with Descartes and Malebranche, knew a little Spinoza, nothing about Aristotle, the Sophists and the Stoics, quite a lot about Plato and Pascal, nothing about Kant, a bit about Hegel, and finally a few passages of Marx which I had studied closely. My way of picking up and then really getting to know philosophy was legendary: I used to enjoy saying it was all done by ‘hearsay’ (the first confused form of knowledge according to Spinoza). I learnt from Jacques Martin who was cleverer than me, by gleaning certain phrases in passing from my friends, and lastly from the seminar papers and essays of my own students. In the end, I naturally made it a point of honour and boasted that ‘I learnt by hearsay’. This distinguished me quite markedly from all my university friends who were much better informed than me, and I used to repeat it by way of paradox and provocation, to arouse astonishment, incredulity, and admiration (!) in other people, to my great embarrassment and pride.” – Louis Althusser, The future lasts forever: a memoir. New York: The New Press, 1992, pp. 165-166.